Flexile Sentry is an enemy in Dark Souls 2. 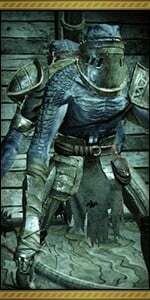 Flexile Sentry is a boss in Dark Souls 2. flexile_sentry.png Fought below the deck of a ship, this boss is a conjoined warrior with one half wielding scimitars and the other spiked clubs. Attacks rapidly and with speed. The boss will rotate one warrior to face the player and attack with that one, then randomly change to the other side to attack with a different style. Take note that when fighting this boss the room will fill slowly with water but only to the waist. This does impede movement a bit but not to a critical point you can still roll and move about the same speed. You can find the Flexile Sentry below the deck of the pirate ship that activates after progressing through the level to pull a lever at the far end of the area. Simply proceed up through the buildings and through the long darkdweller mobs (a torch is handy here.) until you reach the illuminated platform with the lever. When fought on NG+ and beyond, two additional enemies will spawn as soon as the fight begins, they attack quickly, strike hard and aggressively as well as having Ring of Thorns but have low health and should be killed immediately. The Flexile Sentry is a merciless creature whose purpose is to punish the Undead. This terrifying, lizard-like creature oversees the ferrying of undead into the Lost Bastille. Area boss of No-man's Wharf. Accessed by ringing a bell atop the Wharf that docks a ship. 1 14,000 No Suspicious Shadows. No changes to souls awarded beyond Bonfire Intensity 8. Lucatiel of Mirrah can be summoned for this fight, provided the player exhausted her dialogue at the No Man's Wharf bonfire. Her summon sign is located just behind the shortcut gate midway through the area. (SotFS) Bradley of The Old Guard is also available to summon (as a shade) near the new short cut bridge. Be very careful while dodging towards the boss. You may end up in front of the other knight who can pull out a fast swing immediately. It is much easier to deal with the boss when it's using the Spiked Club side only, as it's attacks are much slower and more predictable. Also, don't take your time when fighting him and try to finish him quickly - the room will start flooding with water until you are about chest-deep in it! This will make movement/dodging/etc. extremely difficult and give the boss a great advantage! When you enter the room immediately lock on to boss and begin strafing to the right. Keep the boss in your vision at all times and keep the wooden support beam inbetween the both of you, this way if he lunges it will limit his movement. Use the mirrah greatsword so you have a horizontal attack, and as soon as one of the adds jump on you hit them quickly, there is a slight delay before their attack. If you end up taking a hit, the old sun ring should buy you a bit of time to reposition and/or estus. Once the adds are down, get to the spiked club side of the boss and circle his right side. switch to the thrusting sword and wail away, 2-3 attacks after he swings. If you end up taking a hit buy yourself space by putting the support beam in the center of the room between you and the boss. He should go down quickly and with ease. This is a high-pressure fight. That means you NEED a weapon(s) with the shortest attack animations possible, but with decent reach so you don't have to walk before attacking. You will have more time than you think on NG+7 and CoC. So take the necessary time to kill the two enemies that drop from the ceiling, then focus on the Sentry. The Barbed Club half of the Sentry has many more openings for punishment than the Sabre half of the Sentry. Sprint to keep to that side, and hitting on the sides of the Sentry works nice, too. For endgame, you wanna do about 900 damage per attack if you wanna survive comfortably. I was pacing well with 550 (Lightning Greatsword +10) but with dual Berserker Blades +10, one Magic and one Lightning, I was doing 900 per attack and it was working fine. Dual Lightning infusions would have still worked better, though. Please find clearance and the right boss animation for using Estus. Flexile is highly pressurizing and it is very easy to be hit while using Estus. Similar to Gwyn, you can use the environment to space yourself from him. The wooden pillar in the middle of the room is pretty good at getting the Flexile Sentry stuck, so feel free to use it to give yourself time to heal. For endgame, don't worry about the water. It takes a LONG time before it fills up to kill you, and you don't lose i-frames on roll, so if your roll is 16 i-frames, then you've got nothing to worry about. I made the mistake of trying to speedrun the fight by trying to punish every attack, but I ended up dying. After giving up on that, I was chest-deep in water on my successful attempt, and this was NG+7 with the Company of Champions activated. Using Scraps of Life on the decks above the boss fight area near the mast can damage the assassins that appear alongside the boss on NG+ putting them on minimal health, seemed to have no effect on the boss for me but results may vary, other AoE spells may produce similar results. Wooden pillar in the center of the boss area can block most of his attacks. "Resistance:?" Really? It&apos;s fire. Checked in game data. No Man&apos;s Wharf encounter was incredibly easy as long as you stand on the mace side because poor dude can&apos;t hit to save its life, and if they weren&apos;t easy enough to melee, also leave incredibly big windows for miracle spam. The Flexile in the Lost Sinner basement can go die in a fire though; it&apos;s on knee high water which makes mobility hard, goes scimitars first for most of the fight, has a ton more health and it&apos;s surrounded by kamikazes which limit mobility further. I ended up cheesing it by spamming the hell out of Heavenly Thunder while it was stuck on the doorway. Played as Cleric; Heavenly Thunder and Lightning Spear killed the thing along with Lucatiel. Hell yeah. Can I just block to win? Is it normal that I encounter this guy instead of the Half dragon hollows in sinners rise?